Our tropical getaway to Puerto Vallarta wasn't our only vacation this year. Our other big trip wasn't nearly as luxurious, but it was just as fun. 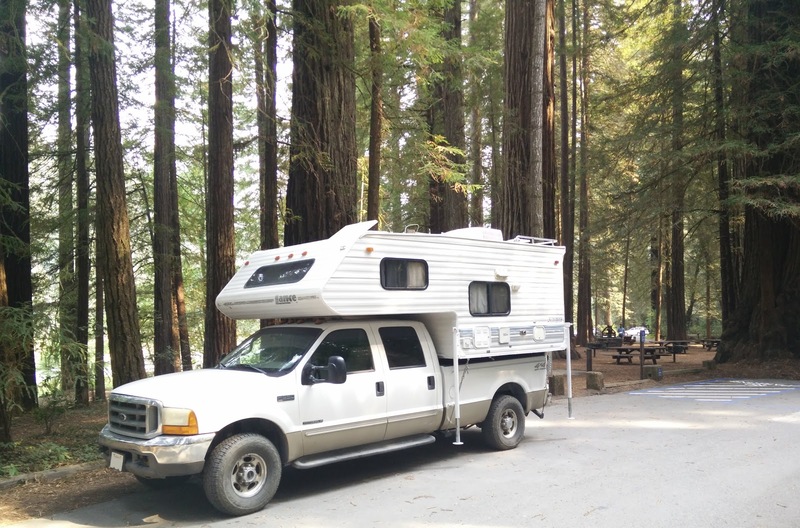 We ventured on a 10-night camping trip to northern California. Read on to learn all about it. This trip was inspired by a wedding we were attending in Napa wine country. We figured if we were going to drive all the way up there, we might as well take our new camper and turn it into a vacation. Our plan was to spend the first night near the wedding venue in Geyserville. After that we would spend a couple days at Humboldt Redwoods State Park, followed by three days at Crater Lake. Our final destination was Lake Siskiyou near Mount Shasta. On the way home from there we spent one night at my aunt's in Modesto to break up the drive. Luckily, the wedding we attended in Geyserville preceded the horrible fires in that area (although there were lots of other fires raging in Nor-Cal and Oregon at the time). It was however, in the middle of an epic heat wave. The temperature the day of the wedding was a scarcely believable 114 degrees. We had a lot of fun at the wedding, but it was still very hot when we went to bed and we didn't have electricity available to run the AC, so it was a bit of a sweaty night. 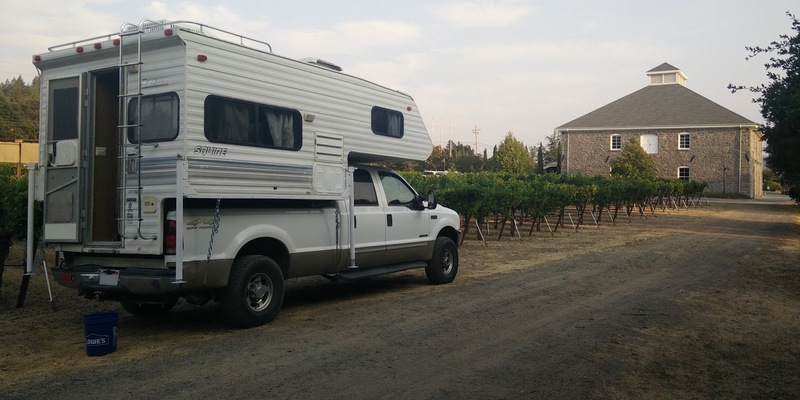 We didn't have electricity because we simply backed our truck/camper into the vineyard next to the venue and slept there. It was very convenient and, best of all, free. In our defense, we tried to stay at a real RV park, but they were all full because it was Labor Day weekend, so we had to improvise. It worked out well, and I don't think anyone noticed or even cared about us staying there. The day after the wedding, we drove to Humboldt Redwoods State Park. We didn't have a reservation (which made Chrissy very nervous) and the online system said there wasn't any space at the campground, but I figured there might be a couple sites available, so it couldn't hurt to show up and ask. The worst thing that could happen is a couple more nights in improvised campsites. A scene from our endless death march super fun hike. Luckily, there were quite a few sites available when we arrived. Apparently quite a few people left on Sunday morning, even though Monday was a holiday. I don't get it. The sky was a little hazy from nearby fires, but it didn't feel like the air quality was bad. It actually gave the forest a very mystical quality. If you've ever visited the redwoods, you know how incredible it is to stand among them, and the haze made it even more magical. While we were there we swam in the beautiful Eel River, blissfully unaware of the potentially toxic algae in it. We also gook a deceptively long hike through what we called Fern Gully. We also relaxed by the campfire and enjoyed quality family time. I camped here as a kid and it was exactly as I remembered it, which is nice, because lots of things aren't nearly as good as we remember them. If you've never seen the redwoods, you have to drive down Avenue of the Giants and have your mind blown by the splendor of these monstrous trees. The next stop on our trip was supposed to be Crater Lake, where we actually had a reservation, but there were a number of serious fires in the area, so we decided to pull an audible and visit Jedediah Smith Redwood State Park/Redwood National Park, which we had never visited before. Our shady napping spot in Ferndale. The drive from Humboldt to Jedediah Smith was on the legendary Pacific Coast Highway, which was absolutely gorgeous. I didn't mind moseying along much slower than normal so we could enjoy the view. Along the way we stopped in the "victorian village" of Ferndale for a coffee and so Frugal Babe could take a nap (she refuses to sleep while driving). Ferndale is a really nice little town, which is definitely worth visiting if you're in the area. When we finally made it to the campground, it had a very similar vibe to our previous spot in Humboldt, but the terrain was a little more level. 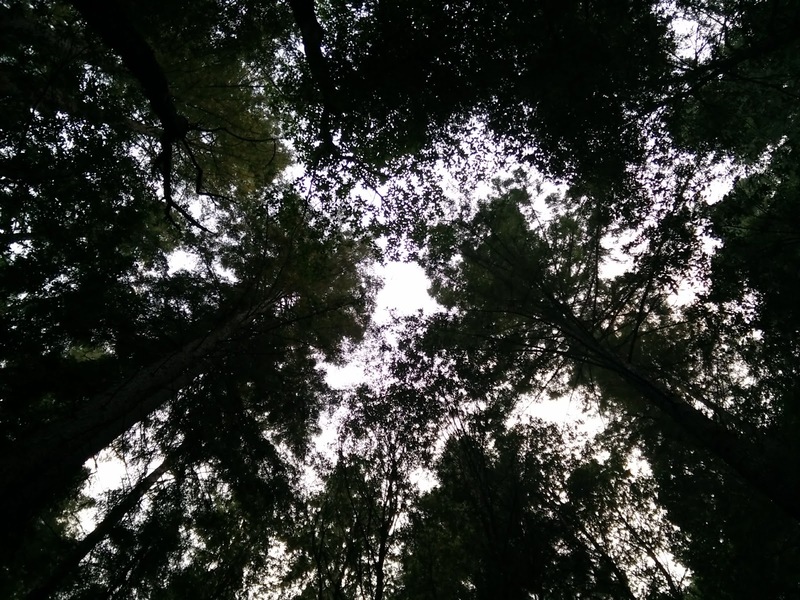 We enjoyed a few more days of frolicking among enormous trees and sprawling ferns. A highlight of this spot was the cool foot bridge (see lead photo, above) across the Smith River. Unfortunately, we had one pretty rainy day where we were forced to huddle inside the camper, which wasn't ideal, but we survived it. Overall, we still had a great time. One final note on this and the previous state park we visited is the price. They charged $35 per night for a campsite. This isn't outrageous, but it is a lot more than the $10 I remember from not that long ago. It's especially pricey when you consider these campgrounds don't have "hookups" (electricity and water at each site), and you have to pay for showers with quarters. On the other hand, it's still a lot cheaper than a hotel, and the money is going to support our wonderful state parks, so I won't complain too much. Our final destination was another spot I visited as a child and absolutely loved, Lake Siskiyou. It's a beautiful little lake at the foot of Mt. Shasta. Chrissy's parents met us here and they had a great time playing with Frugal Babe on the beach and taking her for her first kayak ride. We also enjoyed electricity and running water for the first time on the trip. 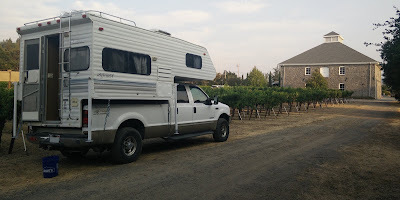 We didn't really need it, but we discovered the battery in the camper had much less capacity than expected, so the electrical hookup was appreciated. That battery will be replaced before our next trip. 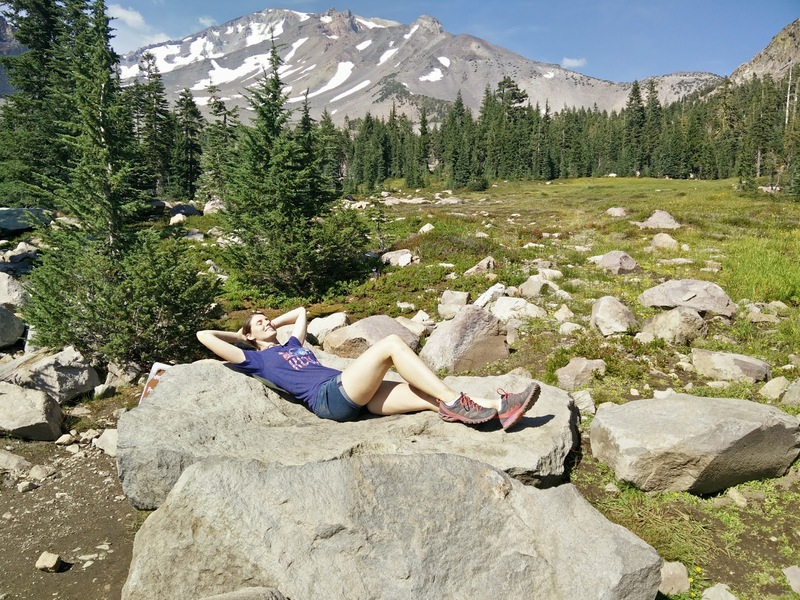 Chrissy enjoyed the fresh mountain air in Panther Meadow. In addition to lounging by the lake, we took a drive up the side of Mt. Shasta to visit Panther Meadow at about 7,000 feet above sea level. It is a beautiful spot, complete with a bubbling spring that is believed to have mystical powers (by some crazies). The campground at Lake Siskiyou was a little more expensive than the state parks at about $40 per night, but it felt justified with the hookups for the camper and free-flowing showers. Right before leaving, we did have one fun incident when the truck refused to start then tried to roll away (and crush me), but we quickly recovered and headed for home. 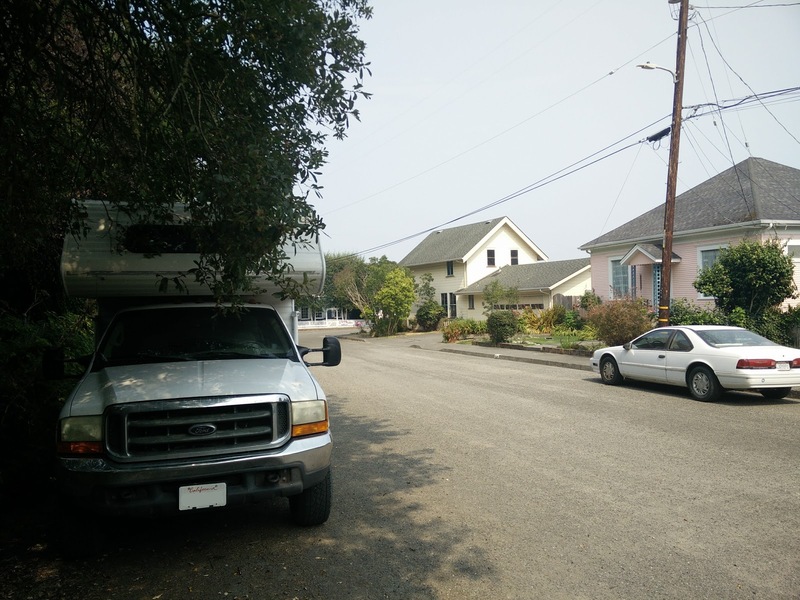 To break up that ~500 mile drive, we stopped at my aunt's house in Modesto. There's only so much driving Frugal Babe can take in a day. The next day we made it home without incident. As you might expect, camping isn't a terribly expensive vacation, but there are still expenses. The total we spent on lodging (parking?) was $294. The larger expense for the trip was diesel fuel to carry us about 1,500 miles round trip. That cost a somewhat depressing $333, but you can't expect a tiny house on wheels to get great fuel economy. Other than that, we didn't really have any expenses we wouldn't have had at home, so I'm not going to count food or anything, which brings our total cost for the 10-day vacation to $627. Not too shabby, considering it's 70% less than our (very reasonably priced) vacation to Puerto Vallarta. I told you this camper would save us money. What are your favorite camping spots? Let us know in the comments. Get cash back on your next vacation with Ebates. Want to get money back after your next big trip? Book it through Ebates and you can. They will give you cash back when you book a trip or buy stuff from one of their thousands of partners. You can even get 10% back on cruises. Try it now and you will get a $10 bonus after you make your first purchase.